Became Christmas as we a – ged. And may this New Year 2013 be one of many! What words of wisdom in these times in which we live? Those are the most helpful words I’ve found here & there. Be well & take care of yourself & those you love & your communities. Merry Christmas and Happy New Year to Geri, you and your family. Sharon & Mike!!! How nice!!!! First response & a quick, rapid one! Thank you & hope Hanukkah was good to you each day & that the New Year 2013 holds health & all good things for the Helds & the “kids.” Loving you great guys back, Phil & Geri too! Much Health,and Happiness in 2013! Mandy and Jon heading off Saturday morning to spend the weekend at Mandy’s parents house. Jaime might be coming over on the LI ferry to New London,Conn for Christmas. Not sure yet. Kids will be back Christmas eve, Mandy has to work Christmas day.MaryLouise and I are doing well. ML is backing cookies etc.Let us pray for Peace and Compromise. We need to lean forward. Enjoy and Best to all. John & Mary Louise, Always & only the best of wishes for the Pachecos as well for Christmas & 2013. Busy household now with the kids going & coming!!! Sure hope Jaime makes it there & good that Jon & Mandy will enjoy “a piece” of Christmas here & there. Glad all is well including the making of the cookies…a must in any home. Love your words of Peace, Compromise, & Lean Forward!!! But if they take any of my SS over the cliff, you’ll see me on the news in Washington, DC, getting arrested. Greetings & Love to all there from Phil & Geri too! Merry Christmas to you and gerri…We are anxiously awaiting Erin, Andy & Mr. Bart too! Too much rush-rush-that is why I order on-line….bwahahaha! Thanks, Margaret! 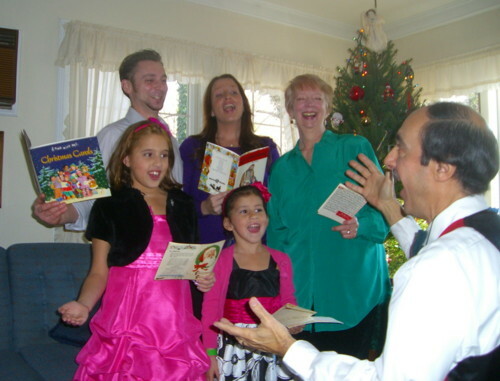 Thinking of you & Jim & all the kids arriving from NY & NJ to join you & Jenn & Alan’s family for “CHRISTMAS SOUTH”!!! –Very special. Yes, it’s “rush-rush” here too on all counts from presents, prep, & now Geri has started cooking TODAY for Tuesday!!! Love to you all & enjoy the moment. Phil & Geri cooking too!